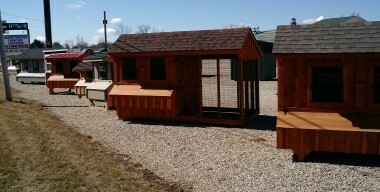 We are happy to be the largest gazebo distributor in Michigan. Our quality is matched by none. Our gazebos are constructed with Southern Yellow Pine that has been kiln-dried before and after being pressure treated. The wood has a #1 grading and is ready for application of stain or paint. They are fully screened-in, with removable screen panels as well as screening under the floors and under the cupola. There are many options to choose from when ordering your gazebo, such as double roofs, curved roofs, white paint, or natural Cabot stain. We also carry white vinyl gazebos. Our vinyl gazebos are becoming our most popular choice due to virtually no maintenance.